The Tufts women’s tennis team competed in its final match of the fall season this weekend, traveling up to Brunswick, Maine for the Bowdoin Invitational. The Jumbos fought hard in both individual and doubles matches against various regional opponents, winning a total of 26 matches. In the round-robin style tournament, no players were given seeds or rankings, and matches were assigned randomly. Many Jumbos, however, faced opponents against whom they will be competing during their upcoming spring campaign. That practice paid off in spades for the Tufts squad, as the partnership of first-year Patricia Obeid and sophomore Katherine Wiley defeated Skidmore 8–4 on the first day of the Invitational. Senior tri-captain Lauren Louks and junior Mina Karamercan racked up three wins in doubles, both in dominant fashion. Louks and Karamercan first defeated a pair from Skidmore, 8–3, and then bounced back from their subsequent 8–5 loss to Bowdoin by crushing a different Bowdoin pairing on Sunday, 8–2. They added a third win against another Skidmore pair later in the day, winning 8–4. Much of the duo’s success is a result of experience, according to Karamercan. Since the Bowdoin Invitational always comes at the end of the fall season, the Tufts squad was prepared to finish strong, both physically and mentally. While the squad focused on bringing maximum effort to every single match, it also made sure to implement technical skills that the players have been working on individually. Tufts’ sense that the Bowdoin Invitational represented its last chance to face true opponents, coupled with a strong work ethic, certainly translated into a successful outing. Perhaps even more impressively, every player in the Jumbos’ lineup contributed in some way to their 26 total victories, either through individual single matches or with prowess in doubles. 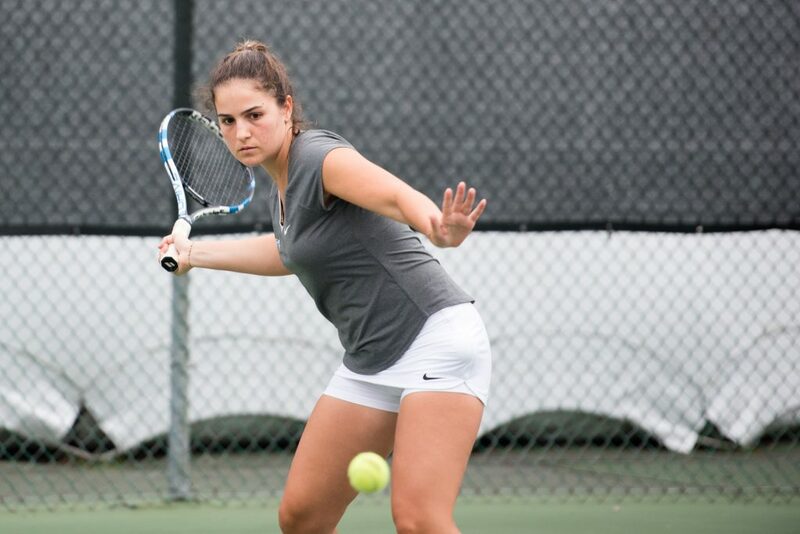 In singles, Louks defeated a talented Wellesley opponent 6–4, 6–2. For her part, Miller beat a Skidmore player handily, 6–2, 6–4. Wiley also emerged victorious in her singles match on Saturday, grinding to eventually beat her Bowdoin opponent in a third-set tiebreaker: 7–5, 4–6, 11–9. Additionally, all three of the team’s first-years stepped up with contributions. In singles, first-year Margot Shea beat her Wellesley opponent 7–5, 6–2. After going up 3–1 in the first set, Tufts first-year Kiara Rose won by default when her Skidmore opponent retired. Besides Obeid’s doubles victory on day one, the New York, N.Y. native also recorded two singles victories (6–2, 6–3 over Skidmore and 6–3, 6–4 against a Bowdoin opponent). The squad will now begin to plan for the upcoming spring season. The women’s primary goals are to maintain their fitness and improve upon their technique during the offseason. Bayard hopes that by training hard in workouts and on the court this winter, the Jumbos will not need to work their way back into being physically fit once spring arrives. Cohesiveness will also be a focus for the Jumbos, as they attempt to further integrate three new members into a young team that has just two seniors. The Jumbos are scheduled to return for their spring campaign on March 11, when they will use the momentum and experience gained this past weekend to compete in a match against Wellesley.